Apologies for the length of time since my last post, but I promise this recipe will not disappoint. 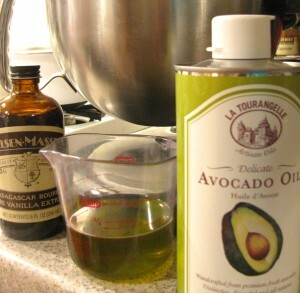 A number of you might be thinking “what, avocado OIL?”…yes, avocado oil. I have eyed it in the grocery store for awhile now, and I finally got around to purchasing a bottle. The brand I bought is La Tourangelle, a California producer of specialty oils, including various nut and seed oils. I’ve wanted to bake with avocado oil as it is heart-healthy and I was curious as to what I could come up with. In addition to being high in monounsaturated fats, which can help reduce cholesterol levels, avocados contain polyunsaturated fats, vitamins C, E, K, and various B vitamins (including B-6, folate, niacin, and riboflavin), as well potassium, magnesium, and lutein, an antioxidant which is good for your eyes and skin. Avocados are one of the few fruits that contains healthy fats. In case you’re curious, grapeseed oil and olive oil are other oils derived from fruits that contain healthy fats. That’s enough science…let’s get to the cake. When I think about avocados, limes also come to mind. The creamy, sweet richness of the avocado pairs very well with the tartness of the lime. (I guess my mind might also go to chips, salsa, and a margarita, but that’s a recipe perhaps for another time!). 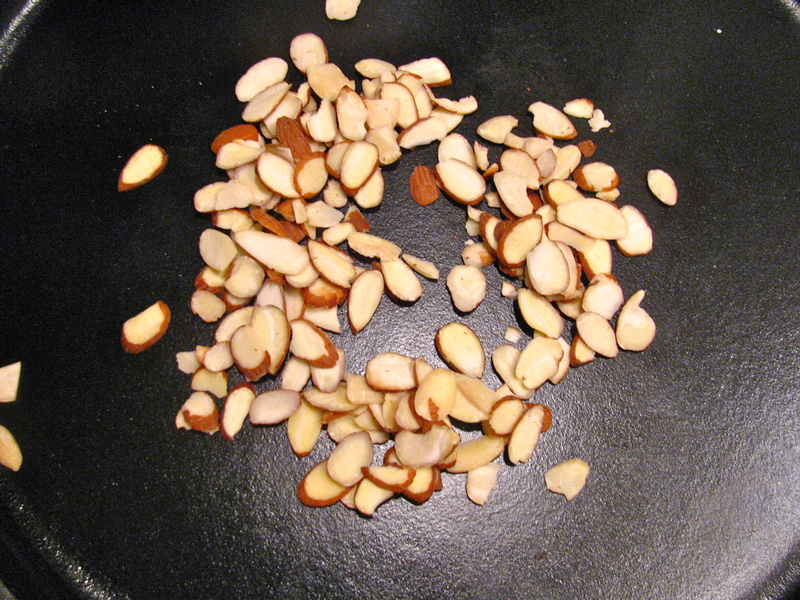 I knew I wanted to incorporate heart-healthy almonds in this recipe as well, and have done so by incorporating almond meal into the batter as well as decorating the top of the finished cake with sliced almonds. 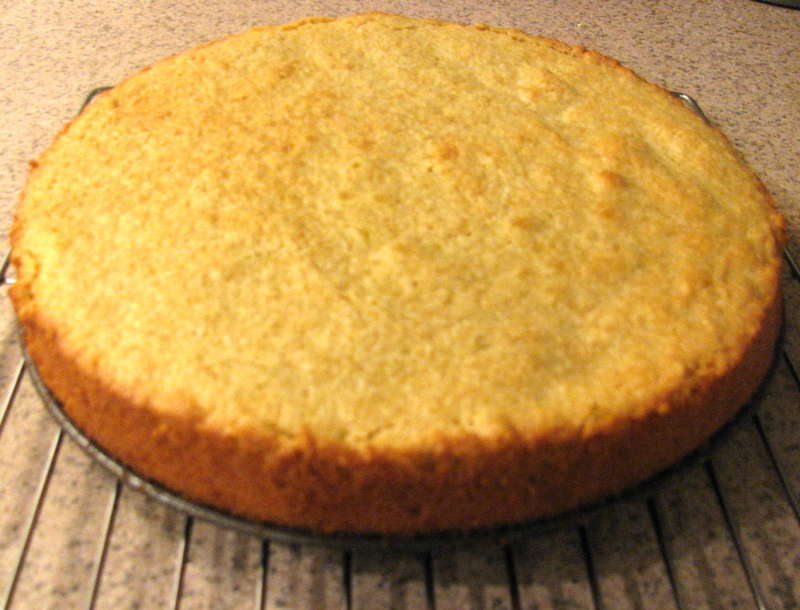 The result is a super moist cake…not too sweet, not too tart. I must disclose that when I first came up with this idea, I searched through my cookbooks and the internet to see what else was out there. Could not find anything in any of my cookbooks and only one recipe on the internet in a blog called alice in bakingland (cute) provided by a self-proclaimed “stay-at-home mum” from New Zealand who was a contestant on a reality show called “Chelsea New Zealand Hottest Home Baker”, and who incorporates lime-infused avocado oil into her lovely looking bundt cake. Preheat oven to 325°F (162°C, Gas Mark 3). Grease a 8″ or 9″ (22 cm or 23 cm ) springform pan and set aside. If you are keeping the recipe dairy-free, do not use butter. I used spray canola oil, but you can use regular canola oil, sunflower, or grape seed oil, for example. 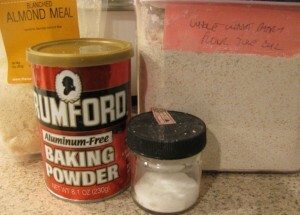 Dry ingredients: Sift the whole wheat pastry flour, baking powder, and salt into a medium-sized bowl. Just to give you an idea, the bowl I use is 3 quarts (a little less than 3 liters. Sift the almond meal into the same bowl (sifting helps get rid of any clumps in the meal). Mix the flour mixture and almond meal together with a whisk or fork. Set aside. 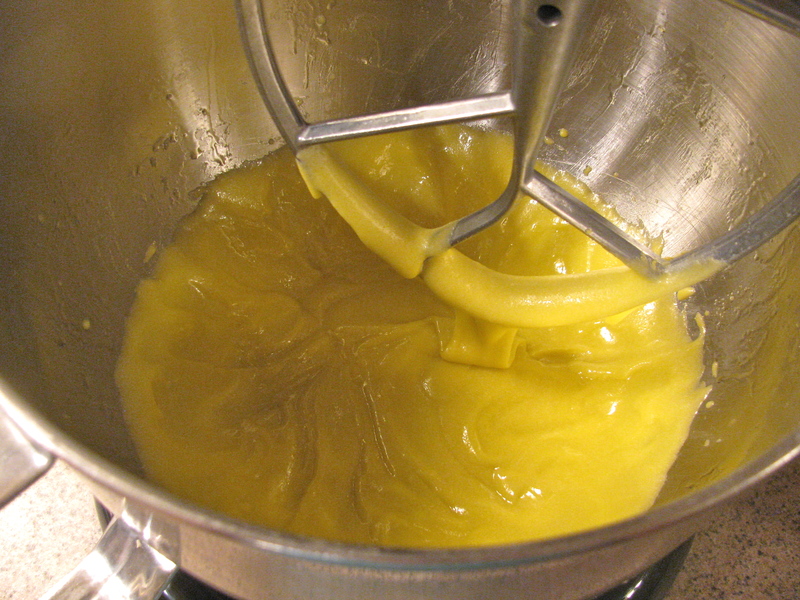 Wet ingredients – part 1: In the bowl of a stand mixer, add the egg yolks and sugar and beat on medium speed until pale and fluffy, approximately 3-4 minutes. 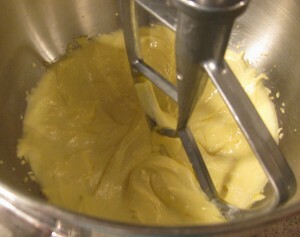 If you do not have a stand mixer, you may use an electric hand mixer. 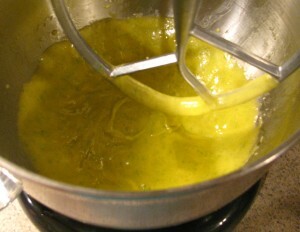 Add the vanilla and lime juice and continue to beat for 2-3 minutes until well-incorporated. Slowly add the avocado oil, beating well. This step should take 2-3 minutes. 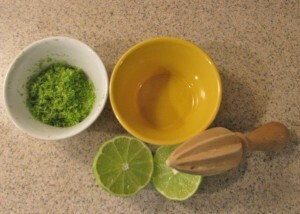 Lastly, add the lime zest and mix for a few seconds until the zest is blended throughout. Wet ingredients – part 2: If you are using a stand mixer and have only one bowl (as I do), transfer the egg yolk/sugar/avocado oil/lime mixture into another bowl and set aside. Wash the bowl to the stand mixture and dry well. If you are using a hand mixer, you may leave the mixture in the bowl you have been using, but you’ll need to get another medium-large bowl for the egg whites. 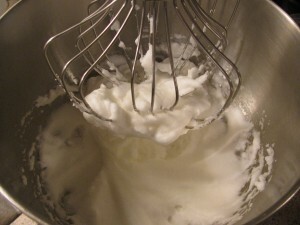 Add the egg whites to the new bowl (make sure it is dry), and whip using the whisk attachment, starting on low-medium speed and working up to medium-high speed until soft peaks form. Beat a few more seconds to make the peaks a bit firmer than soft. 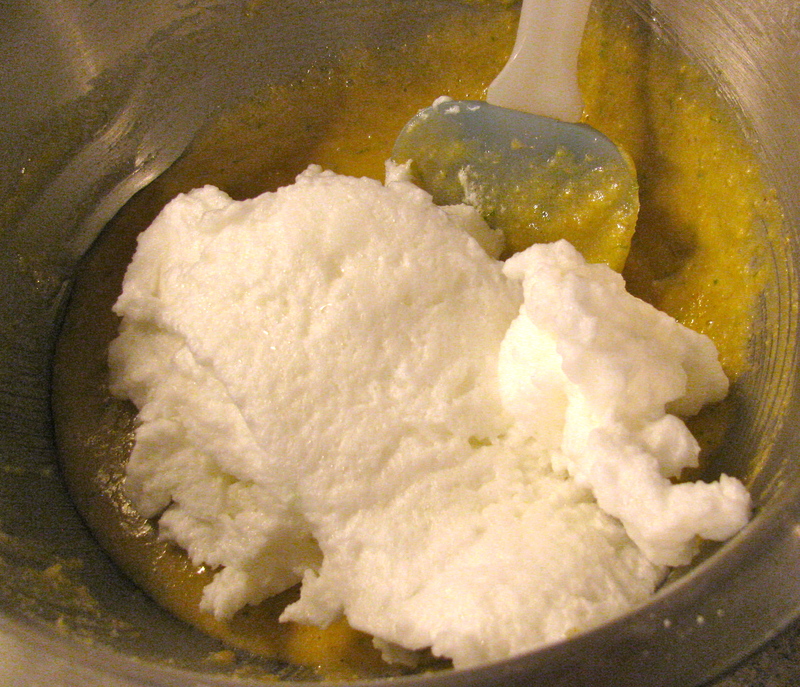 Putting it all together: using a rubber or silicone spatula, fold the egg yolk mixture into the dry ingredients until none of the dry mixture remains dry. Fold in 1/3rd of the egg whites, being careful not to over mix. Add another third of the egg whites and fold in. Finish by folding in the last third. At this point, no ribbons or spots of egg whites should show. 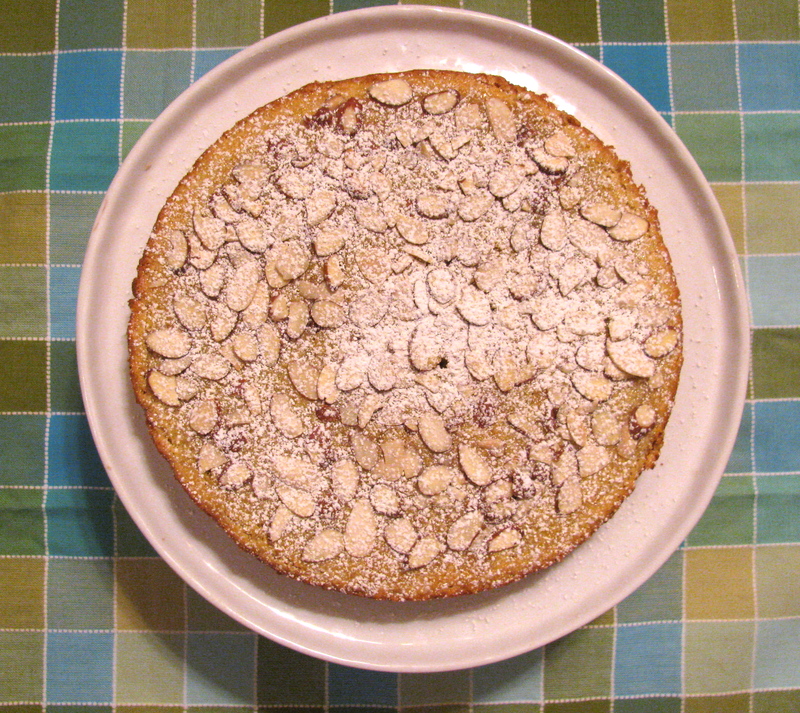 Baking the cake and preparing the sliced almonds: Add the cake batter to the prepared pan and bake for 35 minutes, or until the edges of the cake are golden brown, some areas of the top of the cake are lightly golden brown, and a cake tester comes out clean when inserted into the center of the cake. Put the pan on on a wire rack and let cool 10 minutes. 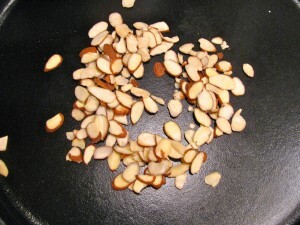 Topping: If your oven stays hot for awhile (even when turned off), turn off the oven and place the sliced almonds for the top of the cake in a cast iron pan or on a cookie sheet or other baking pan and let toast for 10 minutes in the hot oven until just barely toasted, but not browned. If you decide to leave the oven on, you’ll only need about 5 minutes. Watch them carefully for if the oven is still on, they can easily go from toasted to burnt very quickly. 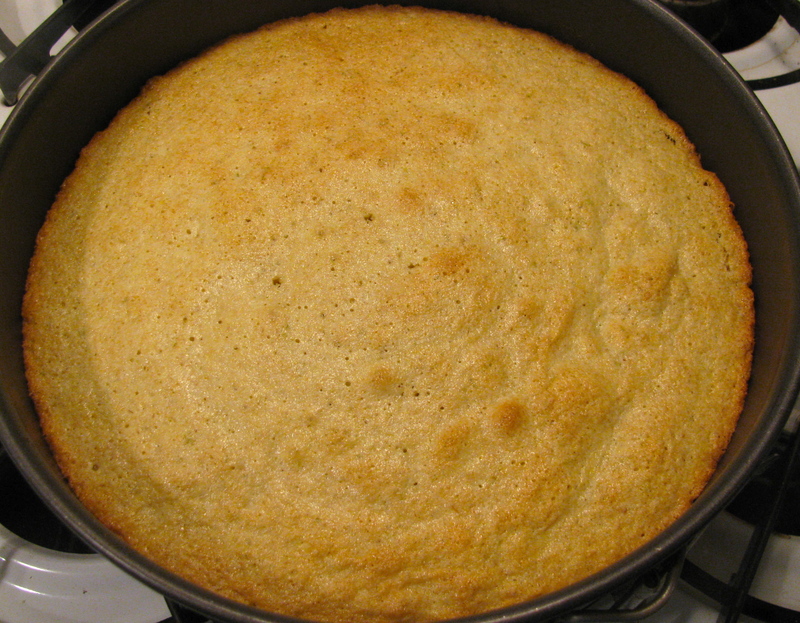 Using an offset spatula, or another tool that is thin and flat and does not have jagged edges, go around the outside of the cake and make sure none of the cake is sticking to the edge of the pan. Remove the outer ring from the springform pan base and let the cake continue to cool on the wire rack. Glaze: Put the lime juice from half a lime in a small bowl. 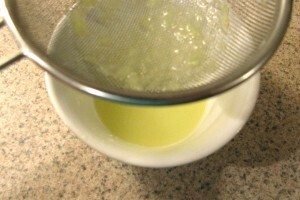 Over the bowl of lime juice, using a mesh sieve, sift 2 TBLs of confectioner’s sugar through the sieve to make sure there are no lumps of sugar (you might need to use the back of a spoon to help press it through the sieve). Stir the sugar into the juice. You want a pourable, green and slightly murky glaze. Taste it. if it taste too tart, add more sugar. if it tastes too sweet or is too thick, just add more lime juice. I ended up using 4 TBL and a little extra lime juice. When the glaze is to your liking, spoon it slowly over the cooled cake. Spread the glaze over the cake using the back of a tablespoon or pastry brush. 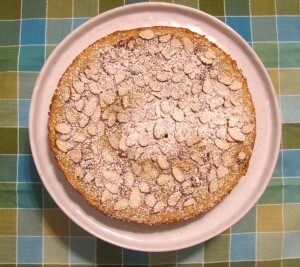 With your hands, place the toasted almonds over the cake and gently the almonds onto the glaze (which acts as a glue). 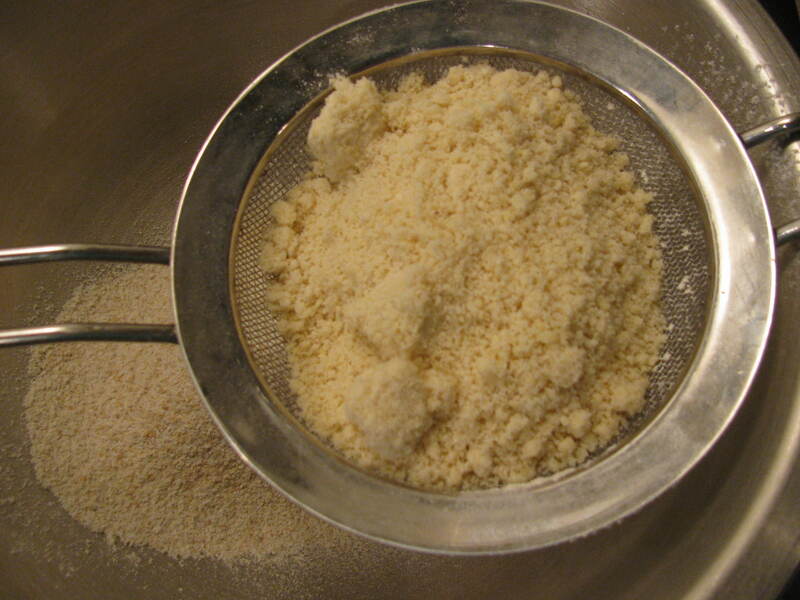 Lastly, using the sieve, dust the top of the cake with another tablespoon of confectioner’s sugar. 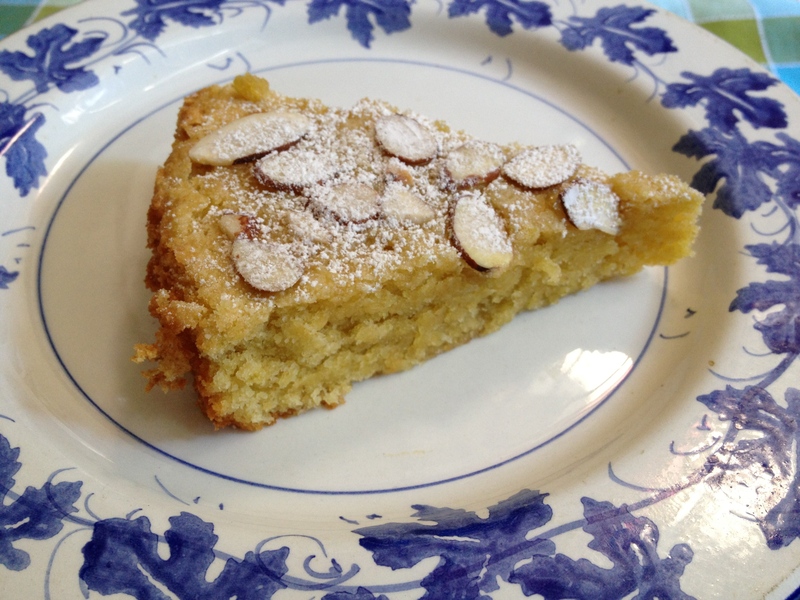 Pretty, delicious, sweet but not too sweet, tart, but too tart, moist, a nice crumb. For my taste buds, the combination of avocado oil and lime and the moistness of the cake, reminded me of meyer lemon bars, which is a very good thing indeed. This cake will keep for at least several days. I suggest refrigerating it if not eating it right away, but letting it get to room temperature before serving. If you do this, you might want to sift some additional confectioner’s sugar over the cake just before serving as some of it will have been absorbed into the cake. Freezes well. ***Separating eggs: always a good idea to have three small bowls on hand: one for the white from the first egg, one for the yolks, and one for the whites for the remaining eggs. If you only use two bowls, you run the risk of contaminating all of your egg whites with egg yolk should any one of your eggs not separate properly. Here’s the method: separate the first egg, putting the yolk in one bowl and the white in another bowl. Be careful not to get any yolk in the white or your egg whites will not whip up properly. IF there is any yolk in the white, either remove the particles of yolk completely, or if you cannot, toss the egg white and start again with a new egg (remembering you do not need the extra yolk). , For the second egg, put the white in the third not-yet-used bowl, and the yolk in the bowl that already has a yolk in it. IF there is any yolk in the second bowl of egg whites, as for the first egg, either remove the particles of yolk or toss the egg white and try again with a new egg. If you are sure that your second egg white is yolk-free, add this egg white to the first egg white bowl. Repeat with the third egg, using the now empty third bowl to receive the white. 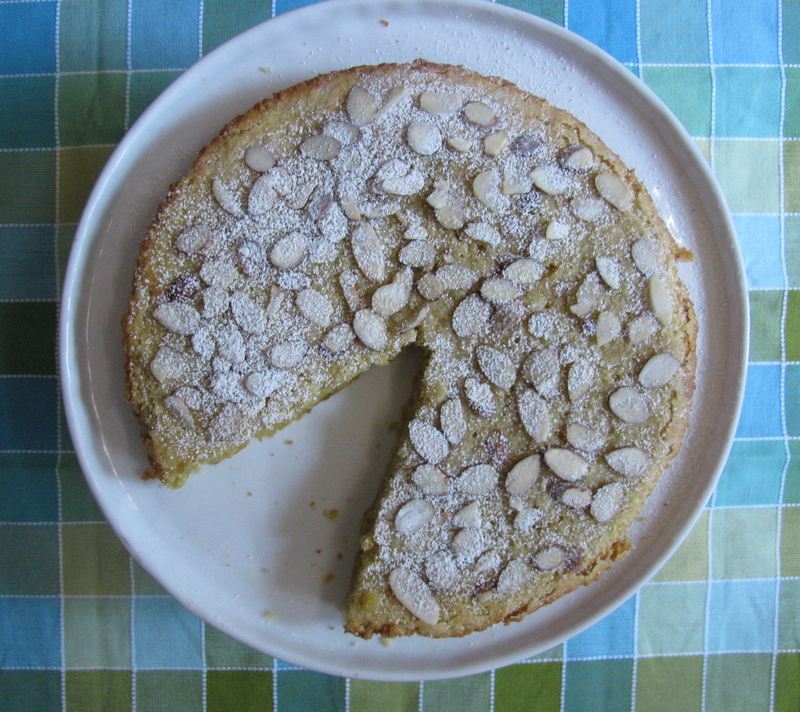 This entry was posted in Cake and tagged almond, almond meal, avocado oil, dairy free, lime, pastry flour by hboltson. Bookmark the permalink. I am fascinated by the truly healthy ingredients in this recipe! I love avocado and I would generally encourage every baker to try to use whole wheat flour when possible. By the way, the finished creation as photographed is simply beautiful. Bravo! I made this last night for our dinner guests and it was a big hit! So tasty, and so quick and easy to make! Thanks for sharing!